Welcome to another installment of LiveAnalysis! Today we have the second meeting in a US Open final between World No. 1 Serena Williams and World No. 2 Victoria Azarenka. Click here to see how Serena Williams arrived to this final (the first time in a while that someone gets to the title match without dropping a set), and click here to see how Victoria Azarenka reached her second straight US Open final, which is her fourth straight hardcourt Slam final. Click here for the detailed H2H between these two (which Serena leads 12 to 3). In 2013, Victoria Azarenka has beaten Serena Williams more times than in the previous 5 years of their H2H (twice as many times, in fact). She’s 2 and 1 against the 16-time Major champ this year, but from 2008 to 2012 Serena won 11 of their 12 matches. All 3 of their 2013 matches have been in finals, with Serena winning in the red clay of Rome, and Azarenka taking both hardcourt matches (in Doha and in Cincinnati). 1. Use that incredible variety of her serve to keep Azarenka guessing. Dominating with her serve is always key for Serena, but more so today. 2. Punish every single Azarenka 2nd serve, and every soft 1st serve as well. In the Cincinnati final, Azarenka somehow won 63% of 2nd serve points. Serena just can’t let that happen again. 3. Be on the lookout for Azarenka’s frequent changes of direction during rallies, and look to counterpunch aggressively to turn around the balance of the points. This is a difficult task that requires a lot of anticipation and footwork discipline, which Serena didn’t really show in Cincy. She’ll have to do better today. 4. Try to engage in as many forehand exchanges as possible. Azarenka is super solid off both wings, but it’s the forehand that tends to crack more often than the backhand. Of course, Serena should look to make Azarenka defend with that shot as much as possible, because if the Belarusian is simply allowed to rally with that shot, things won’t go so well for Serena. 1. Make every single Serena service game a battle. Victoria can’t afford to send short returns straight at Serena, particularly 2nd serve returns. The World No. 2 needs to return into the open court as much as possible, and make Serena feel like there won’t be many free points available during those service games. 2. Find ways to hold serve consistently. This is Azarenka’s toughest task, given the many issues she’s faced with her serve. Essentially, she’s been competing in the past few weeks without a first serve – she’s going for 3/4 speed serves on both her first and second deliveries, just making sure she can avoid having to use her weak 2nd serves. It’s worked so far, but it’s been far from a smooth process. Simply put, if Azarenka can’t repeat her serving performance from the 2nd and 3rd sets of the Cincy final, today’s match will be very, very short. 3. Keep Serena on the run. Azarenka needs to make Serena feel like every ball she’ll hit in this match will be on the run. Of course, mixing in the patterns is a must, too – Serena is too smart to be fooled by simple side-to-side schemes. Azarenka needs to keep Serena guessing by hitting behind her often, as well as using some droppers and timely net approaches. If you missed the last match between these two women, you can read all about that most eventful Cincinnati final by going here. And if you want a detailed stats analysis of that match, you can go here. The Throwball is over, so we’re ready to go! 0-0: Someone screams out just as Azarenka is about to hit her serve. Unfortunate. What follows is a strong rally in which Serena gets the better of a CC FH exchange. Two UFEs by Azarenka follow, so it’s 0-40 to start. Just like in Cincinnati. First BP is saved by an Ace out wide (that was unlike Cincinnati, when Serena won the first 8 points of the match). 15-40. Serena pummels the 2nd serve, and then she keeps accelerating until a CC BH blows by Azarenka. Serena is up an early break! 1-0, Williams: 2nd serve return UFE by Azarenka. Those, she can ill afford today. FH UFE by Azarenka follows. Then, a wild CC BH UFE by Serena makes it 30-15. A simply gorgeous CC BH angled return forces Serena’s error, so it’s 30-all. Then, a FH UFE by Serena off a very short ball by Azarenka. Bad miscue, and it’s 30-40. Also, it’s getting gusty out there. Serena continues her generous ways, as she sends a 2nd ball BH DTL long. Azarenka is back on serve! The wind appears intent on wreaking havoc with this match. Which is rather unfortunate. This would probably favor the more disciplined mover (Azarenka). Something to follow. 1-1: The wind is really bothering Serena at the moment. She’s not taking those extra little steps to adjust to the way the wind moves the ball around, and her shots are flying on her. Azarenka holds to 15, after mostly UFEs by Serena. 2-1, Azarenka: Azarenka plays incredible defense, but Serena remains flatfooted when dealing with the wind. Eventually, Azarenka blasts a BH DTL pass by Serena. But then, at 30-all, a costly miscue by Azarenka, who sends in a deep return into the corner, but then follows it up by dumping a simple CC BH into the net. GP for Serena, who holds after a SW.
Will that UFE by Azarenka at 30-all prove costly? Serena just said during the last game that she can’t play in this wind. Despair Mode seems closer and closer, and Victoria bailed her out. Wind: 100 RT @tennisabstract: Left of the chair 4, right of the chair 0. 2-2: At 30-15, Azarenka plays a phenomenal defensive point – she chased down a hard return into her AD corner, and then somehow retrieved a great BH DTL by Serena, who then sent an angled CC FH wide. Moments later, the Belarusian holds to 15. Azarenka is doing every little thing you need to do in order to be successful in these windy conditions: move your feet until the very last minute, play with a lot of spin and avoid the lines. But more importantly: she’s not letting the wind get into her head and frustrate her. That’s not a good number for Serena Williams. 3-2, Azarenka: Victoria seems to be in control of the rally at 30-15, but she misses a CC FH badly. Moments later, Serena holds. One problem for Azarenka in these conditions: the wind makes it much harder for her to time her signature shots that change the direction of the ball. Hence, she’ll have to work more with angles than with changing the direction of the ball in order to move Serena around. 3-3: Azarenka gets up to a 40-15 lead, and then produces the shot of the day! She hits a drop shot up the middle, and correctly comes behind it. Serena gets to the dropper, but her counter is guessed correctly by Azarenka who stabs at it, and produces a gorgeous lob winner. A triumph of instinctive genius. Great reflex volley-lob thingymagig. Feels like they're both getting to grips with the wind now. 4-3, Azarenka: Serena badly botches a FH volley (that should’ve been a BH volley), but the fires an Ace to make amends. Moments later, Serena has held. Enormous game coming up for Azarenka, who’s held comfortably since getting broken to start the match. 4-4: At 0-15, a magnificent point. Serena seems to have it all wrapped in her favor, as she hits a great angled CC BH and then a BH DTL, but Azarenka survives the ensuing volley, sends a lob that lands smack on the baseline, and fires an I-O FH winner after Serena’s tame reply. Moments later, Victoria fires a CC FH winner for 40-15. Moments later, she holds. That was incredibly impressive by Azarenka, who is performing at a very high level, and shows off the kind of demeanor of a confident elite athlete that doesn’t have a shred of a doubt that they can emerge victorious. Stats Update: Victoria Azarenka has won 8 out of 10 2nd serve points. That’s amazing. She’s also won 9 out of 15 1st serve points. 5-4, Azarenka: Serena starts this crucial game by DFing. But she rebounds by smartly starting a CC BH rally, with her shots being aided by the wind in that direction. 15-all. An Azarenka FH UFE makes it 30-15. Then, a phenomenal rally from Azarenka ends when she hits behind Serena and forces the footwork-induced UFE. 30-all. However, Victoria then misses a very makeable FH return. 40-30. Later, Serena DFs pretty badly – that 2nd serve landed smack in the middle of the net. BP/SP for Azarenka. However, the greatest serve in the history of women’s tennis comes to the rescue, in the form of an Ace up the T, which is then followed by a glorious BH DTL winner. Azarenka retorts with a fantastic BH dropper, so it’s Deuce again. AD Serena after a brutal CC BH winner. That was quite a shot. Victoria then thinks she hit a return winner…challenges and gets it! Amazing shot. Deuce #3. Phenomenal body serve by Serena, and Azarenka gets it back, albeit short. Serena stands well inside the baseline pummeling Victoria, who somehow survives 3 or 4 missiles. Serena puts away the volley, and she has another chance to hold, which she does after a great Ace up the middle. The wind and the linescalling are horrible. The tennis is rising above both of those defects. Fabulous stuff. 5-5: Serena blasts an I-O BH return winner, but then sends a BH CC wide. 15-all. Then, a horrible 2nd serve return UFE by Serena. Off her BH, no less. 30-15. Serena then sends a regulation FH long, so it’s 40-15. A FH DTL winner by Serena, and it’s 40-30. A deep BH return by Serena on yet another 2nd serve, and it’s Deuce #1. Azarenka then tempts danger, as she hits one too many FHs into the middle of the court, and then can’t help but watch as a Serena CC FH Winner to set up BP. 2nd serve again. Serena kills the return, blasting it straight at Azarenka’s left foot, and triggers the error. Serena Williams will serve for the first set! Exactly. Serena, being the all-time great and veteran that she is, eventually adjusted to the tricky conditions, and reaped the rewards. 6-5, Williams: A bomb up the T goes unreturned, and Serena has 3 SPs. Azarenka barely misses on a CC FH, and the set comes to an end. First Set to Serena Williams, 7-5. 0-0: Azarenka falls behind 0-30 in a flash, but rebounds by drilling a FH up the middle. Another rally through the middle of the court ends when Serena gets a look at a BH DTL winner. 15-40. SW by Azarenka, so 30-40. 2nd serve – which is punished by a great CC BH return by Serena that Azarenka can’t re-direct down the line. Early break for Serena! 1-0, Williams: Serena fires an Ace up the T for 40-0, and moments later she holds. The match is far from over, but Azarenka can’t afford to go down a double break to this version of Serena. Long gone is the Serena who claimed she couldn’t play in this wind. She’s focused, and she’s playing the game in the right way, given the conditions. 2-0, Williams: Serena absolutely murders a CC BH – it was hit so hard that Azarenka couldn’t time the reply correctly, even though she was in position to do so. 30-all. But then, a timely dropper gives GP to Azarenka, who badly needs this game. The wind pulls the ball into the AD corner, and Serena can’t adjust. Azarenka has stopped the rut. Tactical Update: Serena has turned this into a CC battle, and she’s winning it quite comfortably. It’s a fantastic tactical ploy, which takes advantage of the windy conditions: changing the direction of the ball with this wind becomes much more challenging. And Serena can still blast away those CC shots without looking for the corners that much. Simply put: Serena has steered the match into a situation where she can consistently overpower Azerenka off both wings. What can Azarenka do? Go for her DTL shots. Yes, it’s more difficult. Yes, it’s potentially dangerous. She doesn’t have an option, though. 2-1, Williams: At 15-30, Azarenka hits a wonderful CC FH + DTL FH combo to set up 15-40. That’s her only shot to stay in this match. Serena saves the first BP with an Ace out wide, though. 30-40. The second BP is lost as Azerenka doesn’t adjust properly for a CC BH that sails long. Deuce #1. Then, a SW into Azarenka’s BH. GP for Serena, which is converted via a fantastic SW up the T.
3-1, Williams: Azarenka gets embroiled in a CC BH rally, and Serena blasts a CC BH winner past her. 30-all. Then, a DF. 30-40. Virtually a match point, really. 2nd serve… and it’s into the net. Serena is up a double break! 4-1, Williams: What do you know…Serena badly overhits a simple short BH, and it’s 15-40. The first is saved after a tough rally that involved plenty of CC FHs. Azarenka goes for a DTL FH that was extremely low %, and she misses by a good margin. 30-40. Azarenka drives a beauty of a CC BH return, and she forces the error. Azarenka gets one break back! 4-2, Williams: Serena sends a regulation CC BH long, so Victoria is up 30-15. However, her 3rd DF makes it 30-all. SW makes it 40-30. The game ends on a wonderful exchange that had the women trading blows first on the AD court, and then on the Deuce court. Azarenka gets a good CC FH in, and as soon as the window opens slightly for a DTL FH, she goes for it and doesn’t miss. Great point. 4-3, Williams: Glorious point at 15-0 – Azarenka bludgeons Serena’s BH corner, comes to net and hits a very good volley…but not good enough to avoid Serena tracking it down and firing a CC FH pass. Soon enough, it’s 40-0. Azarenka tries to go for an early BH DTL, and it misses by a foot, at least. Serena is one win away from Slam #17. 5-3, Williams: At 15-0, Azarenka goes for two straight DTL shots, but misses the second. 15-all. SW, 30-15. But then, 2 straight DTL shots actually work – the point finishes with a glorious FH DTL winner, and moments later, she’s held. There’s no other way to do it, really: Serena was comfortably winning the CC exchanges, so Azarenka has to battle the wind (which has gone down a bit in the past few games), and get Serena on the run with those DTL shots off her FH and her BH. 5-4, Williams: Serena once again starts with simple CC patters, with loads of pace. She’s so very smart. High percentage play in this environment. 15-0. 2nd serve….and it’s a DF into the net. 15-all. A short rally ends with a Serena CC FH that goes long. 15-30. What a return by Azarenka – unbelievable BH stab return ends up forcing Serena’s error…though that was a makeable shot. 15-40. The first is saved by a great serve, and a great DTL FH that opened up a simple CC FH putaway. 30-40. Another incredible return by Azarenka, and after a spectacular defensive get, she’s broken back after Serena sends a BH long. We’re back on serve. Azarenka’s 1st serve returns in that game were a masterful, incredible thing. 5-5: A DF makes it 0-30. Serena then blasts a return winner, so it’s 0-40. Azarenka goes on the offensive, but it seems like her I-I FH was long. And it’s in! By a milimeter, it seems. Point is replayed, and Serena misses a return. 15-40. Serena badly misses a BH, 30-40. But then, disaster for Victoria: a regulation BH ends up in the net, and Serena will once again serve for the US Open! All that hard work to break serve was for naught, apparently. Let’s see if Azarenka has another ace up her sleeve. 6-5, Williams: Serena hits one of her favorite serves, the Deuce court slider out wide, and it’s an Ace. 15-0. Azarenka then blasts a beautiful I-O FH, and forces the error. 15-all. Serena goes for a big CC BH that was wide open…and yanks it wide. 15-30. SW, 30-all. But now it’s 30-40 after Serena nets a BH after a decent return by Azarenka, and Azarenka forces the TB after a Serena DF! Tiebreaker – Victoria Azarenka will serve first. 1-0, Azarenka: SW for Serena, into the body. 1-1: BH UFE by Azarenka. 2-1, Williams: Insane CC BH winner by Serena. Glorious shot. Minibreak. 3-1, Williams: A tense, tense point ends with Azarenka driving a FH swinging volley smack into the baseline. Incredible. 3-2, Williams: Incredible defense by Azarenka, after Serena was fully in command of it, but can’t make the drop volley. Fantastic pass by Azarenka, who made Serena get very low for that volley. Minibreak. 3-3: Azarenka frames a running FH. 4-3, Williams: Serena gets a look at plenty of real estate in the Deuce corner of Azarenka’s side of the court, but she can’t place the CC BH within the lines. 4-4: Simply gorgeous I-O BH by Azarenka, with the good volley to finish it off, though Serena did get to it, but sent her lob long. 5-4, Azarenka: Serena badly fails to move her feet for a CC BH, and dumps it into the net. The tricky wind did her in. Minibreak. 6-4, Azarenka: The glorious Deuce-court slider goes for a SW, so it’ll be SP #2 for Azarenka. 6-5, Azarenka: A fun, powerful rally ends when Serena dares Azarenka with a FH DTL, and Azarenka nets the CC FH. Minibreak. 6-6: 2nd serve…SW into Serena’s BH. Not quite a body serve, but Serena didn’t adjust at all. 7-6, Azarenka: Incredible 1st serve return by Azarenka, followed by a great I-O FH, and Serena’s desperate shot flies long. We’re into a decider! Second Set to Victoria Azarenka, 7-6 (6). Third Set – Serena Williams will serve first. 0-0: Serena opens the 3rd set with a DF. She then dumps a tame BH into the net. 0-30. A good Serena BH DTL forces Azarenka’s error. 15-30. However, some good serves lead to a 40-30 lead. A framed FH by Azarenka, and it’s a hold for Serena. 1-0, Williams: FH UFE by Azarenka, 0-15. A violent CC BH by Azarenka goes by Serena, who slips. 15-all. 2nd serve return into the net. 30-15. A deep CC FH by Azarenka pushes Serena back and forces the error. 40-15. But Serena then blasts a nonchalant CC FH winner. 40-30. Then, a Serena BH UFE seals the key hold for Victoria. 1-1: A BH UFE by Serena makes it 15-all. Serena takes advantage of a desperate Azarenka squash shot, and drills a CC BH to force the error. 30-15. 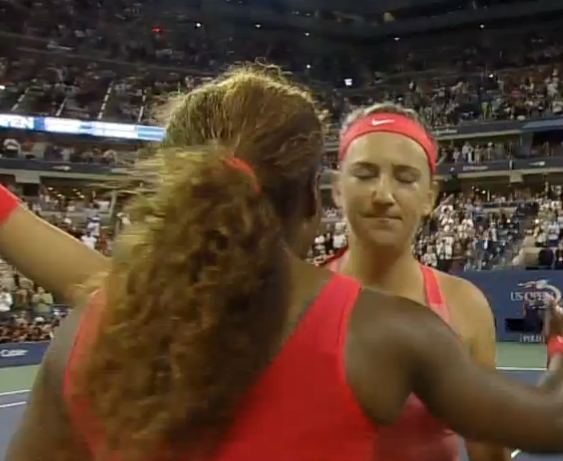 Azarenka then tries a surprising dropper by Serena, gets there, but sends her reply long. 40-15. But then, a Serena CC FH ends up in the net. 40-30. An interesting rally ensues, with Azarenka belting FHs DTL into Serena’s BH, but then the rally switches sides, and Azarenka can’t handle the pace. 2-1, Williams: Serena barely misses a FH swinging volley, so it’s 30-0. Azarenka badly misses a FH DTL, so it’s 30-15. Nice SW out wide, 40-15. Serena then gets a look at 2 CC FHs, and comes very close to the lines on both, forcing Victoria’s error. 40-30. A DF sends us into Deuce #1. Azarenka then gets the better of a CC FH rally (a rarity in this match), and it’s GP for her. A CC FH ends with an Azarenka FH into the net (that has happened plenty of times today). Deuce #2. 2nd serve. FH DTL UFE by Azarenka, and it’s BP #1 of the 3rd set for Serena. A fun rally ends with both women at net, after an Azarenka dropper. Great hands and reflexes by Azarenka, who comes up with the winning volley. Deuce #3. Azarenka FH DTL UFE, so BP for Serena again. OOF – Azarenka misses a 2nd serve by about 4 feet. Serena is up a break! That serve…is such a liability. 2 bad DFs in that game, and now Azarenka has to claw back from yet another deficit. 3-1, Williams: WOW – A glorious GOLAZO lob winner by Serena for 30-0. Then, an ace (126 mph – biggest of the match, #8th Ace of the match), for 40-0. 2nd serve Ace up the T by Serena, who doesn’t seem intent to let this lead slip away. That was quite the ominous hold by the defending champ. Emphatic, ruthless and full of excellence. We’ll see if Azarenka still has a plot twist or two inside her. 4-1, Williams: FH UFE by Azarenka makes it 30-all. Another FH UFE makes it 30-40. Virtual match point for Serena. And yet another FH UFE by Azarenka hands Serena Williams the double-break. 5-1, Williams: BH UFE by Azarenka, 15-0. 2nd serve. Now a good FH CC by Azarenka forces the error. 15-all. Then Serena gets a lob over Azarenka again, after the Belarusian hits a short approach straight at her. 30-15. Azarenka then goes for a BH DTL return winner, and misses. 40-15, double championship point. A brutal rally ends when Serena sends a CC FH into the net. 40-30. 2nd serve. 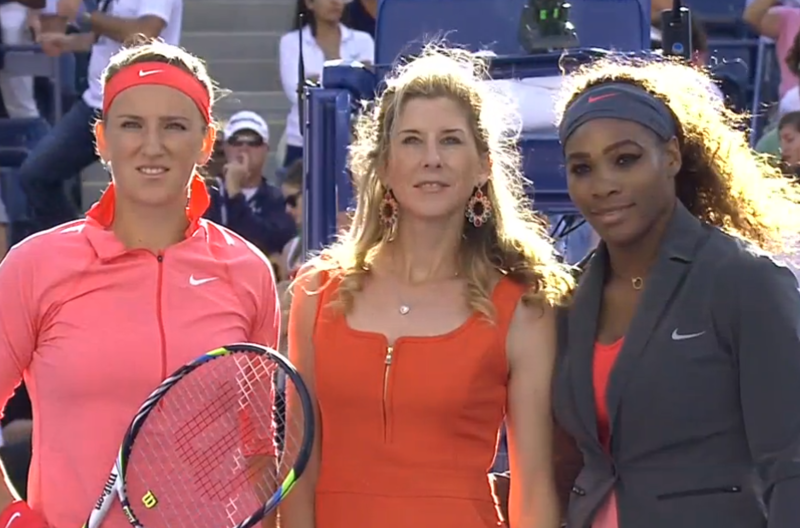 Azarenka sends her CC BH return long, and Serena Williams is your 2013 US Open champion! Game, Set and Match to Serena Williams, 7-5, 6-7 (6), 6-1. First off, that was a wonderful final, even though the wind threatened to destroy it. All credit goes to the two women who partook in it, since they found ways to compete through the unfavorable and tricky conditions. Playing a Major final is an enormous mental challenge. Playing it through horrific wind just amps that up significantly. Second, I’d like to express my admiration for Victoria Azarenka, who left it all out there today. She was determined, and refused to let go of a match that seemed like a foregone conclusion midway through the second set. Even though the World No. 2 was having to perform all sorts of tricks to mask her main weakness (that serve) and survive brutal rallies in which she was getting overpowered, she still managed to claw back from two breaks down to take that second set from the great Serena Williams. No small feat, and one that not many women in the WTA can claim to have achieved. Third, I remember something I read about Serena Williams a while ago. I think it was the infamous Rolling Stone profile, which I actually enjoyed. The one part I disliked, though, was the simplistic assertion that Serena Williams is who she is because she hits the ball harder than everyone else. I thought that idea did a disservice to one of the greatest champions the sport has ever seen. And today’s final was quite the showcase. In the early stages of the match, it seemed that Serena was going to fall into the trap Novak Djokovic fell in last year’s final: letting the wind drive them crazy (and take them out of the match). At one point in the first set, the camera caught Serena saying “I can’t play in this wind.” At the time, it seemed like a factual statement: the now 17-time Slam champion wasn’t adjusting for her shots, and more worryingly, insisted on going for winners that just weren’t there for her. She wasn’t working the conditions – the conditions were working her. And soon enough, Serena found herself with her back against the wall in that first set. But then Serena banished the wind-induced despair and settled into a more coherent scheme: less re-directing of the ball, more air under her shots, less of an impetus to go for lines, better adjustment ahead of hitting through the ball, and using her great slice serves. What Serena realized was that the wind was making it nearly impossible for Azarenka to take the initiative in rallies by going down-the-line with either her forehand and backhand, since the timing necessary to execute those shots properly gets thrown off completely by the wind. Hence, cross-court rallies are the high percentage play, and Serena was always looking to do some damage with either pace or angles. The US Open champ survived an extremely tricky 4-5 service game in the first, and won six of the next seven games. Of course, Serena did lose a two break lead afterwards, and failed to serve out the match twice in the second set. But another trait of great champions is being able to overcome adversity during a match – particularly in the form of missed opportunities. The 6-1 scoreline in the decider tells you all you need to know about Serena’s ability to let go of the disappointment of the second set and take what she believes to be hers. With this, Serena Williams has won her 17th Grand Slam title. I still think her prodigious, once-in-many-generations talents merit quite a few more, and thankfully, it seems like she’ll keep going for more glory. The finish line becomes quite tangible at age 31, and I don’t think she’s ready to cross it yet. Naturally, she’ll need a bit of good fortune – her Australian Open campaign this year got derailed by a truly unlucky ankle twist during her first round match. But if luck allows her to avoid those pitfalls, Serena will surely march on until her body (and not her mind) tell her to stop. Which is pretty great news for those of us who like tennis. Simply because I’m not sure we’ll see another talent like hers in our lifetime. Boy Victoria, you fought so well, planted so many doubts in me and Serebaby, but of course last word, with so much at stakes, with a number one needed this slam way more than anyone else, Serena did it!!! Good job Serena, but well well fought fight Vika!Much respect to you too, I see you doing way way more in the future! Great article, JJ. Brave effort by Vika, but she will long have regrets about that first set, when Serena was looking all too vincible for the first half dozen games or so, getting fewer than half her first serves in and failing to take advantage of Vika’s second serves — which she usually feeds on — time and again. There are those who will say (wrongly in my view) that the greats of the 70’s, 80’s and 90’s faced tougher competition than Serena has. Martina and Chris had to face each other, they will tell you, and Steffi had to face Monica Seles. OK, then. But even if you take the Chris-Martina match-up out of the equation (Martina had a 10-4 edge over Evert in GS Finals), Martina lost 10 finals to other players and Chris lost 6. Steffi and Seles were 3-3, so even discounting Monica, Graf lost 6 finals to other players. Serena’s GS Final record is now 17-4, an 81% winning percentage against the best of the best when the chips were all on the table. If the US Open seeds were to stay the same at the AO in Melbourne with the addition of Sharapova, Serena will have 17 grand slams to her credit while the other 31 seeds COMBINED have 12. (Li-1, Kuznetsova 2, Kvitova 1, Stosur 1, Ivanovic 1, Azarenka 2, Sharapova 4. True, but Serena’s % of semi-finals won, leading to finals, is much better than theirs. Chris lost 18 semifinals in addition to 16 finals. Martina lost 12 semifinals, in addition to 14 finals. Serena has only lost 3 times in the semis and four times in the finals. That is remarkable. Obviously, the reason Serena hasn’t made it to as many SF’s and F’s as Martina and Chris is that she has lost many more matches in the 4th round and the QF’s. But that is in great measure the result of the fact that there are so many more dangerous players now than there were twenty or thirty years ago. How many times, for example, did Chris or Martina have to play a former grand slam champion in the opening round, as Serena did at the US Open, not to mention Toronto. She would have had to play Bartoli in R2 at Dubai, after a R1 bye, had she not withdrawn. She played Jankovic in R1 at the Olympics last year. In the 1970’s and 80’s there were about half a dozen dangerous players; now I’ll bet there are close to 100 players who have won tournaments, made it to the top 20 at some point, and/or claimed an impressive scalp or two. Chris and Martina were great, great players, no question, but they very rarely had to face a dangerous opponent before the QF, and often not before the SF. Suzanne Lenglen lost one match in something like eight years. Helen Wills won 19 of the 22 GSF’s she competed in (and two of the losses were because of defaults due to illness). Why don’t we consider them the GOAT? Because there was so little competition back then. The same is true, to a somewhat lesser extent, in the 1970’s, 80’s, and 90’s. The WTA talent pool is, IMO, much deeper now than it was just five or six years ago.